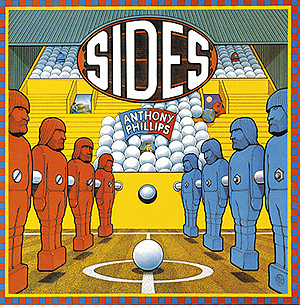 A further release in the on-going series of re-issues of Ant's back catalogue is a re-mastered double CD edition of Sides, which was originally released in 1979. The album itself has been re-mastered from the original master tapes by Simon Heyworth and includes the non-album track Souvenir as an extra track on the first CD. The extra CD includes variations and alternate mixes of the songs from the album including some unique new mixes which have been made from the original multi-track masters especially for this release. Also included is the edited single version of Um & Aargh which has not previously been available on CD. Featuring the same core team from Wise After The Event of producer Rupert Hine together with the rhythm section of Michael Giles and John G. Perry, Sides also includes some outstanding vocal performances from Dan Owen and Dale Newman as well as contributions from John Hackett, Mel Collins, Morris Pert, Ray Cooper and Frank Racotti. The re-issue also includes new liner notes with contributions from producer Rupert Hine and Dale Newman together with Ant's own memories of the album.